The Sparks slot machine was developed by Netent and it is available to play for free or for real money in Kroon casino. This new game from developer Netent looks amazing with its attractive bright colours. The features of the game are what matter most, of course, and they were not overlooked during the making of this slot machine. The various game options decide how a player can win money and how much they stand to make. 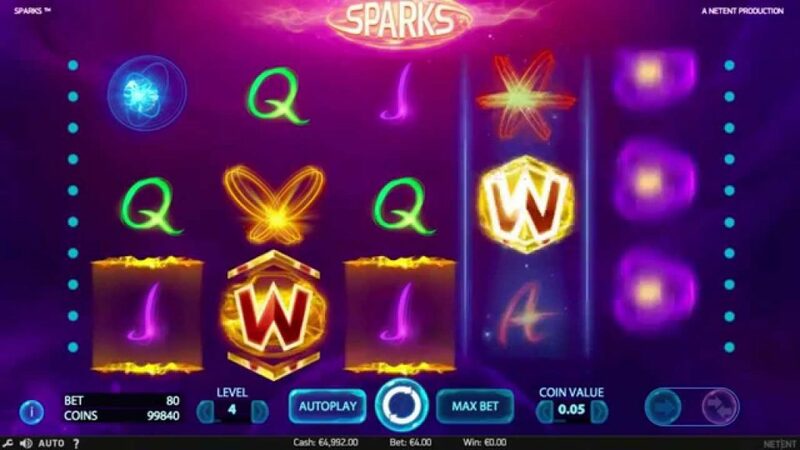 Players will soon encounter the many unique features of the Sparks slot machine. One of the game features that stands out immediately when you open the game is that players can choose to win in one or both directions. When they choose to win in just one direction, only winning combinations from the left are worth money. If you choose the win in both directions, you can double your chance of winning because winning combinations from the right will also be worth something. The both-way win mode can be switched back to the one-way win mode before each spin. You can switch between these options if you want. When you want to maximise your chances of winning, it is recommended to go for the two-way win mode. Note that this does require higher bets from the player, in addition to offering a higher chance to win. The Sparks slot machine features a special wild in the form of an expanding cloning wild. This feature creates new opportunities to earn some money. The expanding cloning wild plays a special role in this game and offers even more than the expanding wild you may already be familiar with. A regular expanding wild can spread across the reel, but the expanding cloning wild does more. The symbols around the special wild can be cloned, which promises players even higher profits. This wild has even more to offer in the two-way win mode. The Sparks slot machine has five reels and three rows, which means the game can be played at various levels. The level, like the coin value, can be customised by the player. If you want to play with the maximum bet right away, there is a separate button for that. The choice between the two-way and one-way win modes is made by clicking the arrows on the right side of the screen. If you want to choose the one-way win mode, simply click the single arrow. If you prefer the two-way win mode, choose the arrows that point in both directions. If you want to know exactly what the winning combinations are worth, you can consult the Sparks slot machine’s prize table.